After getting over my initial melt down when I arrived at the bus station at San Pedro de Atacama, Chile, I have enjoyed a lovely three days here. The trip from Santiago with Tur-Bus only took about 25 hours. When I got off the bus it was like a person with Obsessive Compulsive Disorder’s nightmare. Nothing but dusty roads! It was suppose to be a 10 minute walk to the hostel. I had a map but having no street signs, and it being dark did not help matters. A massive tip…try and take only one bag! I have my backpack, a trolley bag and a day pack (plus my handbag). At this point I was definitely cursing myself for packing so much stuff. However, I can’t dispose of any of my winter stuff just yet because, although it is the desert, it is hot during the day, but the temperature drops way down at night. After about half an hour and showing a couple of people my map (who didn’t really understand any English), I came upon Backpackers San Pedro. More disappointment lay in wait. The six bed mixed dorm was sooooo small there was no rooms for my two large bags. Fortunately there was another small adjoining room so I set up in there. I also had a top bunk…I hate top bunks! There were no steps up to it and it was as rickety as anything. I felt like the whole thing could collapse…poor person beneath me! I couldn’t even sit up in bed as my head would have gone through the ceiling. The bottom bunk wasn’t any better, no room to sit on the bed without hitting your head on the top bunk. Next challenge was the crappy lockers. Not only are they tiny, one could yank the door and the parts you put your padlock through would just break away. Next was the shower…the instructions said to turn it onto hot and wait for it to heat up, after five minutes the hot water automatically shuts off. No problem, you just start the process again. What I found amusing was they had signs everywhere saying “Save Water, Save the World” (after all San Pedro is in the driest desert in the world). I fail to see how running all that water down the drain while you wait for the water to get hot, then it is so hot you have to waste a whole lot more water waiting for it to cool down is helping to save water! So enough of the moaning…it would be a boring trip without these little challenges. I have realised that being adaptable when travelling is something that is crucial. 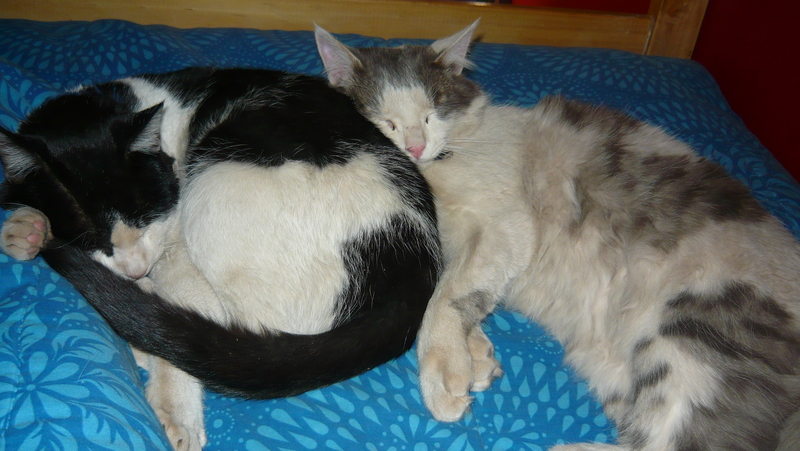 One thing that has made me happy is the two resident cats at the hostel. One morning they were both cuddled up on my bed when I woke. Everyone is friendly here and have had nice room-mates. The first day here I went for a wander around the town. I discovered that there was a shorter route from the bus station to the hostel so will take that route when I go back to the bus station. It’s a lovely little town. It has a very Peruvian feel to it with a lot of the same handicrafts as Peru. There was a street parade which I love. The music is so uplifting and the dancing and costumes are a sight to see. I had an empanada and café con leche (coffee with milk) at a little café. The empanada was huge and sometimes you just don’t quite get what you expect to. I was brought a cup of hot milk. I was starting to think, hmmmmm, where is the coffee? Next minute a jar of Nescafe is put on my table! The coffee wasn’t very strong so had to add about 5 teaspoons of coffee. It was actually a really nice cup of coffee with hot milk. 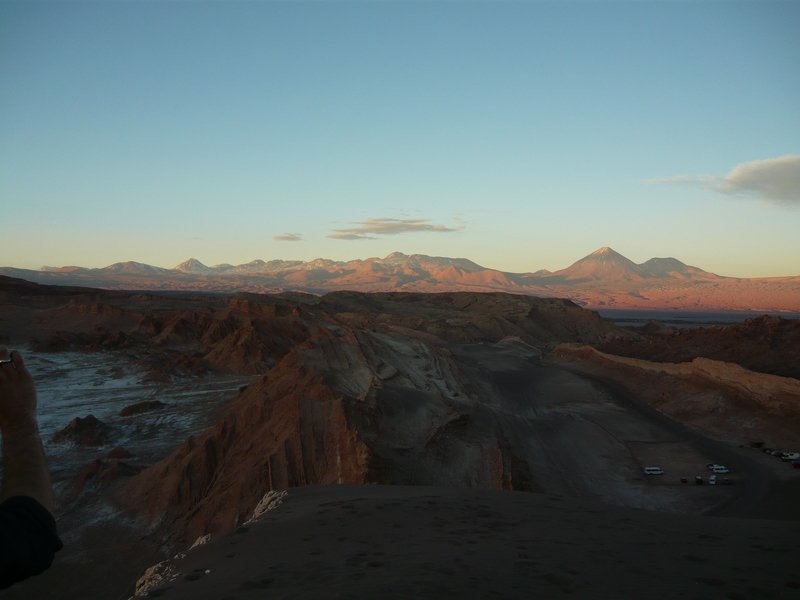 The next day I did a tour through the hostel to Valle de la Muerte (Death Valley) and Valle de la Luna (Moon Valley). Our lovely guide Elise (who also runs the hostel with her husband), told us a lot of history about both these places. We walked through a salt cave and had to use torches, otherwise it was pitch black. The whole area is salt that has hardened. It is only brown because of the layers of dust that have settled over the years. There is very little rain here so the dust never gets washed away. There are a few patches here and there where you can see the white of the salt. We climbed up to the top of a sand dune in Moon Valley to watch the sunset. During the sunset the Andes change to some beautiful shades of pink. Quite a lovely sight. I have spent my last day here just chilling out in the hostel waiting for my bus at 8.30pm to Arica which is north of Chile, just 18km from the Peruvian border. Thanks Taiwanda. I had another interesting challenge with the bus from Arequipa to Moquegua. If I didn’t laugh about it I would have cried! More about that little challenge in a future blog.